If you post print on high end bleached, clay coated or white mottled board, you've discovered that to die cut, you either have to slow the machine way down or double pass your corrugated board to avoid ink smearing. The CMI In-line After-Dryer System gives you the ability to bring your finishing line up to full speed, even when printing high graphics, and/or overprints. By isolating the die cutter from the last down, you'll also get improved color registration. You'll avoid ink smearing because the board is already dry by the time it enters the die cut section! For box makers who are double passing, adding a dryer means an increase in production of at least 100%! Available for any size flexo rotary die-cutter from 24" x 66" to 100" x 212". This dryer's transfer system transports the board through the dryer precisely, and adjustments aren't needed for varying board thicknesses. 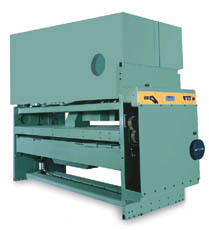 The need for costly, high maintenance vacuum belt transfer systems is also eliminated. Available in your choice of gas, electric, UV, Infrared, or Steam industrial heat sources - thermostatically controlled and thermally protected with a maximum available temperature at board surface of 250 degrees-electric and 500 degrees-natural gas. Pre-wired and plumbed for quick, easy installation and start-up. Vacuum transfer of the board through the dryer section. Hot air knife section provides high velocity hot air to the printed surface. Low pressure vacuum return to evacuate moisture and vapors. Deckeling system to narrow the air knife to the width of the board. Electric heating section is SCR controlled. Gear driven to mesh with existing gears in the last print station and the die cutter. Added benefit of eliminating die cut shock.